(CNN) - Maine Gov. Paul LePage ordered a 36-foot mural depicting the state's labor history be removed from the lobby of the Department of Labor headquarters building in Augusta, Maine, according to LePage's office. The plan put forth by the Republican's administration also includes renaming several department conference rooms that carry names of pro-labor icons. LePage press secretary Adrienne Bennett said discussions about the mural began months ago. After they received phone calls in opposition to the mural, his administration concluded the art showed favoritism toward a certain group. "We understand the value of history and respect the artist, we are now exploring options of where it can go," Bennett said. "We want to find the appropriate place for it. We want to find it a home." Bennett said the Maine Arts Commission will help find a suitable place for the art. 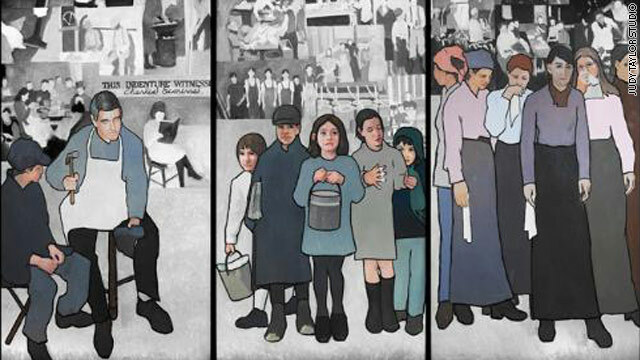 The 11-panel mural depicts labor scenes including a cobbler and a textile worker, and pro-labor organizations have used the action to criticize the governor. A statement from the Maine AFL-CIO said removing the mural is an "insult to working men and women" and is another example of how LePage is putting politics before people. "No matter what you name a room, no matter how many pictures you take down, the truth is that this state was built by and for working people and this move dishonors the generations of hard working Mainers who came before us," the statement said. "Paul LePage cannot erase our history, and he will not silence the voice of working people in Maine." LePage, a first-term governor, was elected with 38 percent of the vote and Tea Party support in the November elections, defeating independent Eliot Cutler and Democrat Libby Mitchell. Laura Boyett, the acting commissioner for the Maine Department of Labor, in a letter to her employees, said the department received feedback that the building is "not perceived as equally receptive to both businesses and workers," and is therefore removing the mural and renaming all of the conference rooms. "If either of our two constituencies perceives that they are not welcome in our administration building and this translates to a belief that their needs will not be heard or met by this department, then it presents a barrier to achieving our mission," Boyett wrote. Are they going to allow that incompetant idiot to do that? Put it in the broom closet where it belongs. *cough* The Governor of Maine is a bigot!!! Also an idiot!!! This reminds me of the Taliban when they blew up the Buddhas of Bamiyan in Afghanistan. No matter what you hang on the walls there will be one group or another who will find it offensive in one way or another. Now they are removing all signs of labors achievements. It reminds me of the Soviets doing the same thing every time a new leader was to take power, but then isn't that the way the republicans and the Party of NO seem to be going! This is reminiscent of the Taliban destroying the ancient and historically significant Buddhas of Bamiyan carved into the hills of Kabul Afghanistan. International communities rebuked their actions, as an extreme example of intolerance. The destruction of irreplaceable antiquity, on a scale commensurate with the Sphinx in Egypt, made the world aware of just how dangerous they really are before they took down the Twin Towers. The Tea Party strikes me as a Christian derivative of the same ignorant following as their Muslim brothers. They have the same disdain for women and children and stubbornly shove their brand of religion down everybody' s throat. Their real religion is greed, and the Christian pretense is but a Union that they manipulate to stay in power and keep their pockets full. They are intolerant of any body else's Union.